There are dozens of ways to transport yourself from A to B. Travelling by plane is not even considered travelling by some people and with the number of cars increasing, congestion on the roads means a lot of hassle sometimes as well. Basically therefore, one of the most fantastic ways to travel is by train. The first public trains gained popularity in the 19th century, starting mainly in the United Kingdom, but expanding fast in other countries as well. The density of the train network grew rapidly during the early 20th century and also during the first decades after WWII. Since then though, in some countries, travelling by train became much less popular due to the increased car mobility of people, which took a flight during the 1950's and 1960's. And although in some countries travelling by train is still very popular, in general the % of people travelling by car is still decreasing. Still, among train and railway enthusiasts, the travelling by train has become more and more popular during the last decades. Some of them are regular passenger services while others are expensive special tourist trains travelling along routes of the old days. Depending on your budget, the choice is still wide though and new lines have even been opening during recent years, like the completion of the railway to Darwin, making it possible to travel all the way up north in Australia. The Eastern and Oriental Express is a luxury train between Singapore, Malaysia and Thailand. It runs from Woodlands Train Checkpoint (since 1 July 2011, before that it started from Tanjong Pagar Railway Station) and Hua Lamphong, Bangkok, stopping at Kuala Lumpur Sentral, Butterworth and Kanchanaburi. The total trip takes 3 days (2 nights on the train) and basically is a luxury tour package with many options to get out of the train and visit places along the way. Since 2007, the train has also travelled between Bangkok and Vientiane, the capital city of Laos. The Qinghai-Tibet Railway is one of the newest train services in the world, officially inaugurated on the 1st of July, 2006 with the opening of the last leg from Golmud. Officially called the Qingzang Railway, it travels from Xining in Qinghai province, China, to Lhasa, the capital of Tibet. There are, however, other cities in China, where you can get on the train and travel directly to the Tibetan capital, including all the way from Beijing, Shanghai, Chengdu and even Guangzhou. From Golmud, it's 1,142 kilometre, from Xining about 1,950 kilometres. The line includes the Tanggula Pass, which, at 5,072 metres above sea level, is the world's highest rail track. The 1,338-metre-long Fenghuoshan tunnel is the highest rail tunnel in the world at 4,905 metres above sea level. Over 80% of the Golmud-Lhasa train is at an altitude of more than 4,000 metres and there are oxygen supplies are available for each passenger in the train, hopefully preventing altitude sickness. It is expected that new lines and branches will open, connecting Lhasa with other places like Nyinchi, Shigatse and Xigaze and even on to the border with Nepal. Some of the constructions have begun already and most of them will be completed before 2020. Rumors about extensions towards India and other Asian countries are not more than rumors! The Trans-Siberian Railway, the dream of Czars and Bolsheviks alike, to unite a large and diverse country and secure Russia's place in the far east, nowadays is one of the most popular railways for travellers. The railway passes through the remote and beautiful Siberian countryside on it's way to the Pacific Ocean, a journey of seven days, eight time zones and over 9,250 kilometres. The Trans-Siberian, and her counterparts the Trans-Mongolian and Trans-Manchurian, are one of the classic train and overland journeys, providing a slow and romantic view of the Russian landscape, people and culture. Running from Moscow to Vladivostok for 9,259 kilometres, the Trans-Siberian "Rossiya" leaves every second day for a seven-day journey. Train No.001 runs westbound while train No.002 runs eastbound. The marker at Vladivostok shows a distance of 9,288 kilometres from Moscow. This is because from 1956 to 2001 many trains went between Moscow and Kirov via Yaroslavl instead of Nizhny Novgorod.This would add some 29 kilometres to the distances from Moscow, making Vladivostok kilometre 9,288. Running through Russia, Mongolia and China, the Trans-Mongolian route is 7,622 kilometres (4,736 miles) long and runs through the Ural Mountains, Siberia, the Gobi Desert and the high steppe of Mongolia and passes through the Great Wall of China on its way to Beijing. The train ride from Moscow into the Urals is mostly Pine and Birch forests interrupted by industrial wastelands, and includes a crossing of the Volga river. After leaving the Urals, you enter Siberian plains, forests, open grass plains and boggy, swampy areas. Approaching Irkutsk the land starts to get hillier heading up towards Lake Baikal. Heading down through Mongolia you get more grass plains. Looking out the window, travellers will likely see wild horses, and Mongolian nomads gers surrounded by small herds of cows and sheep. After Ulan Bator, you start to enter the Gobi desert, continuing into China. After Jining, the desert ends and you get into Chinese agriculture and mountains. Getting towards Beijing, travellers will get many chances to spy the Great Wall during the times when the train emerges from the long, dark stretches through tunnels. This weekly service leaves Moscow (Train No.004) on every Tuesday heading east, while westbound train (No.003) leaves Beijing on every Wednesday. The journey on each direction takes six days. As well as the through Moscow-Beijing trains, there is a separate weekly Moscow-Ulan Bator service (Trains No.005 and No.006). From Moscow, train No.006 departs every Friday, while the westbound train No.005 from Ulan Bator leaves every Wednesday. The journey from each direction takes five days. The Blue Train (Die Bloutrein in Afrikaans) is a train that travels between Pretoria and Cape Town in South Africa. It is one of the most luxurious trains in the world and a great alternative to the regular trains if you have the money. Before 2002, it also operates along the Garden Route, to the Victoria Falls and towards Hoedspruit (for Kruger National Park, but nowadays the only one is the 1,600-kilometre-long route (taking about 27 hours) between the capital and the Cape, although there are a few occasional trips to Durban and Pilanesberg National Park. The original Orient Express ran from 1883 to 2009. The route changed frequently but originally ran between Paris and Istanbul. In 2007. In 1977, the Orient Express stopped serving Istanbul though but a through overnight service from Paris to Vienna kept running. It ran for the very last time from Paris on Friday, June 8, 2007. After this, the route, although still called the Orient Express, was shortened to start from Strasbourg instead, but even then the train was attached at Karlsruhe to the overnight sleeper service from Amsterdam to Vienna. On 14 December 2009, the Orient Express stopped operations, but up until now the famous Venice-Simplon Orient Express train keeps running trains. It is a private venture using original carriages from the 1920s and 1930s and it regularly runs luxury trains from London to Venice and to other destinations in Europe, including the original route from Paris to Istanbul. The Flåmsbana is one of the best train trips in Scandinavia. It is part of the Norway in a Nutshell trip, which is one of the most popular trips in the south of Norway. The Norway in a Nutshell route is a circular route that can be done in either direction. Following the route anti-clockwise you will travel from Voss to Myrdal on the Oslo-Bergen railway, Myrdal to Flåm by the Flåm to Gudvangen by ferry, and finally Gudvangen to Voss by bus. The journey on the Flåmsbana railway is regarded as one of the high points on the journey. The 20-kilometre-long train journey from the mountain station of Myrdal and down to Flåm deep in the fjord takes around 55 minutes. On the journey you have views of some of the most magnificent mountain scenery in Norway with an ever-changing panorama of tall mountains and thundering waterfalls. The train moves slowly or stops at the best views. 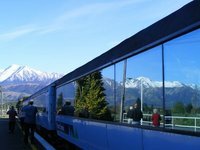 The Glacier Express is one of the best train rides in Europe and in fact anywhere on this planet. The route runs between St. Moritz in the southeast of the country and Zermatt more to the southwest of Switzerland. There are several stops on the way, including Davos, Chur, Brig and Visp. The total trip takes you through 91 tunnels, across 291 tunnels and over the 2,033-metre-high Oberalp Pass. It's a narrow gauge railway and is often considered to be one of the slowest express trains in the world, as the total trip takes around 7.5 hours for less than 300 kilometres in total. You can travel either 1st or 2nd class and there are several panorama cars and a restaurant car. The trip is very beautiful in winter, which, together with the summer high season, is a popular time. It's just as nice though in spring and fall, so if you want it to be a bit quieter, go during that time. There is just one daily train in winter and up to 4 in summer, one of which runs directly to Davos. The Jungfrau Railway (Jungfraubahn, JB) is perhaps as famous for its prices as for the spectacular views, but in this case you get what you pay for! The line climbs from Interlaken at a height of 500 metres to the Jungfraujoch Station which at 3,454 metres (11,332 feet) is the highest railway station in Europe. 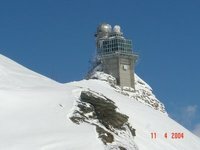 The terminus known as "Top of Europe" is an underground station with tunnels leading out onto the glacier surface of the Jungfraujoch. Visitors from the lowlands will notice both the thin air and the chill - the average temperature here in midsummer is just below freezing. Remaining indoors, there's the Ice Palace, a fascinating collection of ice sculptures actually within the glacier itself or head out to the ice plateau for stunning views which stretch as far as the Black Forest in Germany. In good weather, husky sled rides and summer skiing are popular, or to go higher, take the lift to the Sphinx Observatory for more expansive views. Higher still, a marked out and poled trail leads up over the glacier to the Monchsjoch Hut at 3,657 metres (almost 12,000 feet), the highest hiking trail in The Alps. This hike is entirely within the Jungfrau-Aletsch-Bietschhorn UNESCO World Heritage Site. Running between Union Station in Toronto, Ontario and Pacific Central Station in Vancouver, British Columbia, The Canadian is the longest part of the trans-continental train journey across Canada. The train travels through the scenic lakelands and boreal forest of northern Ontario, across the western plains of the Prairies and the splendid Canadian Rockies, and finishes its journey on the Pacific coast of British Columbia. The journey takes three days: leaving Toronto on Tuesday morning, you arrive in Winnipeg on Wednesday afternoon, Jasper on Thursday afternoon, and Vancouver on Friday morning. Chihuahua is the starting point for the famous Ferrocarril Chihuahua al Pacífico (Copper Canyon Railway) which travels two times daily to the Pacific coastline to the city of Los Mochis, Sinaloa and its port Topolobampo, though the beautiful Copper Canyon. Two trains operate on this route between Los Mochis and Chihuahua: one trip is for tourists only and is much faster, the second daily trip is slower, stopping en route at about 15 places and is a combined trip with cargo. There are 36 bridges and 87 tunnels on the 655-kilometre-long train trip. The railway passes through landscapes that include sheer canyon walls, waterfalls and high desert plains. The Copper Canyon, or Barranca del Cobre is a series of 6 different canyons in the Sierra Tarahumura, which is in the southwestern part of the state of Chihuahua. All the canyons added together are larger and some parts are deeper then the Grand Canyon in the USA, although no individual canyon in Barranca del Cobre is larger then the Grand Canyon. The Chihuahuah Pacifico railroad goes up and down the canyon, which is known by the nickname Chepe. 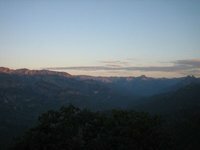 The canyons are the traditional home of the Tarahumara people, which are known for their long distance running ability. The Rocky Mountaineer is two-day tour through the Canadian part of the Rocky Mountains. The train travels during the day, so you can enjoy the magnificent landscapes in the western part of this country, including canyons, rivers, valleys and glacial lakes. There are several trips possible, including the First Passage to the West route from Vancouver, British Columbia via Kamloops to Banff or Calgary in Alberta. Another one is the Journey through the Clouds route from Vancouver via Kamloops to Jasper, also in Alberta. The Rocky Mountaineer company also offers less popular but also spectacular trips to Whistler and Prince George, north of Vancouver, on the Rainforest to Gold Rush route (travelling via Prince George to Jasper) and Whistler Sea to Sky Climb, the latter being a day trip from Vancouver. 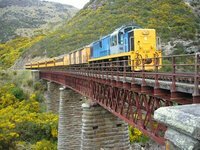 One of the most scenic routes in the world is the TranzAlpine between Christchurch and Greymouth on the South Island of New Zealand and has been in operation since 1987. The scenery along this 223-kilometre-long trip is outstanding, crossing the New Zealand Alps and passing many tunnels and viaducts, one of which is over 70 metres high! After leaving Christchurch, the train travels through the fertile Canterbury Plains past the Waimakariri River along the Main South Line, to Rolleston. It then turns onto the Midland Line, which passes through the Southern Alps past the spectacular Waimakariri River gorge, via the Otira Tunnel and terminates in Greymouth, on the West Coast. The Tren a las Nubes (or in English: Train to the Clouds) is a train that runs in the Salta Province, connecting the Argentinian northwest with the Chilean border high up in the Andes mountains. The train travels over 4,220 metres above sea level, making it the third highest railway in the world. Originally built for economical and social reasons, it is now of primarily tourist value as a heritage railway. The train leaves Salta station usually once a week for the 15 hour, 434 kilometre-long round trip to the viaduct La Polvorilla, located at 4,220 metres The curved viaduct is 224 metres long and 70 metres high. From Salta, the train enters first the Valle de Lerma and then the Quebrada del Toro before reaching the Puna. It is known as the Train of the Clouds because clouds can be often be seen around and under the bridges and slopes of the landscape the railway passes through. This is version 16. Last edited at 11:12 on May 29, 17 by Utrecht. 2 articles link to this page.